You are on our North American site serving the USA and Canada. 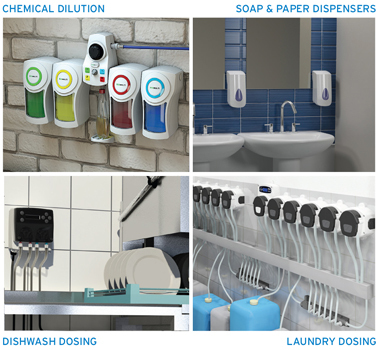 Brightwell Dispensers is a global designer and manufacturer of innovative dispensers for soap, paper, and chemicals for the cleaning and hygiene industry. We export to over 85 countries, supported by our network of exclusive distributors. We offer a range of dispensers for soap, paper, toilet tissue and hand towels. We also offer touch free dispensers for environments where hygiene is paramount. The dispensers work for your requirements with different pumps, containers and styles, and are ideal for all areas such as public washrooms and commercial kitchens. Find out more about our soap and paper dispensers. Chemical dilution systems make cleaning easy, save and efficient for businesses as they dispense the right amount of chemical. Our range includes systems that dose one shot of chemical to diluting up to five chemicals from one dispenser for all your cleaning needs. Our dispensers are suitable for any commercial environment and are cost-effective and easy to use. Find out more about our chemical dilution solutions. Our laundry dosing systems are designed for hard-working commercial environments and offer the most reliable, easy-to-use and cost-effective models on the market. They dispense the right amount of chemical to ensure that laundry comes out clean and fresh. Our laundry dosing systems work with tunnel machines, card-reader and PLC-controlled machines and small washer extractors as well as large intelligent and non-intelligent machines that take loads up to 100kg. They are suitable for on-premise and industrial laundry across all commercial facilities including hotels, care homes and hospitals. Find out more about our laundry dispensing systems. Quantura is a reliable and efficient warewash dispensing range that meets the demands of commercial kitchens. Quantura ensures that your commercial dishwashers work at their best by providing precise chemical dosing for the best clean. The range works for a wide variety of commercial dishwashers including glass, under-the-counter, single-tank and tunnel machines. Find out more about our warewashing dispensing systems. Bespoke design and branding. Design your own dispenser from your own idea or with guidance from our in-house design team. You can also distribute products under your brand with our in-house branding facility. Exclusivity. Use unique pin positions or access codes to prevent any other chemicals used with your dispenser. Resource Hub. On our website, you can download all the information you need on our products from images to manuals. When it comes to cleaning – we have you covered. To find out more about how Brightwell Dispensers can help your business, contact us today.